We’re introducing a slight change to the what quantities are adjusted in craftybase. Essentially you will find a new field whilst editing a project called: Sales Batch Quantity. A Sales Batch Quantity is the quantity you wish to decrease your Stock by whenever you make a sale. So if you sell soap in lots of 2 bars, then each sale will decrease your Stock by 2. This change has come about as a few of our users noticed that when adding a Make Log, the Stock would only increment by the quantity made and not the batch quantity. This was because we designed craftybase with the idea that what you make is what you sell - when in fact this is not the way everyone works. Say you make soap, and you make a minimum of 8 soap bars each time. 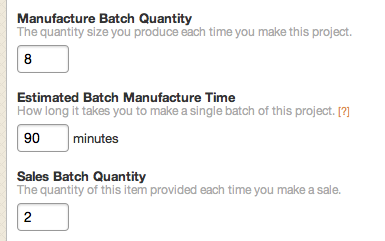 If you make 2 lots of this batch then craftybase would increment your stock count by 2, as we assumed that the batch made would be sold as a whole unit. 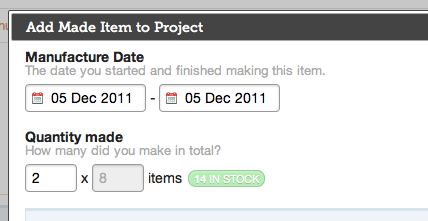 However, this will change and your stock will increment by 16 as we are now counting the individual units in your inventory independently of your sales (note: the example above started at -2 in stock). For some, you won’t notice this change as the defaults mean the site runs the same way just as before. But for those of you that work in this way then we hope this change will help you keep better track of your inventory stock on hand and help you manage your production workflow better.